The island of Ireland is divided into two countries; the southern and north-western regions constitute the Republic of Ireland, an independent, democratic country. The northeast is Northern Ireland and presently is a part of the United Kingdom. This is a special destination for many reasons with much to see and do, but none more than its legendary links courses. There are over 400 golf courses in Ireland, including 50 true Links out of the 151 worldwide. Golf in Ireland can be broadly divided into four regions. The famed Southwest Region is home to many of the truly mystical links such as Waterville and Ballybunion which needs no introduction. The North Coast is a land of blue mountains and forest parks, mazy lakes and windswept moors with a series of lovely links including the iconic championship courses like Royal Portrush and Royal County Down that consistently feature among the Top 10 golf courses in the world. Then there is the vibrant capital of Dublin on the eastern seaboard, several of whose courses having hosted the Irish Open and Ryder Cup. Finally, the Northwest is a little known gem (until recently) that needs to be experienced in person to appreciate. The beauty of Ireland is not just what the eye can behold, but what the heart can perceive, and the stunning scenery is matched by the genuine warmth and friendliness of the people. To this, add a vibrant nightlife, glimpse of an ancient civilization, cultural odyssey with a unique musical legacy and a spectacular coastline; and you will soon realize why one truly can forget the cares of modern life by escaping to the Emerald Isle. Weather in Ireland can be unpredictable. But March to August is ideally suited for visitors when the temperatures are warm and the days long to test your skills on the windswept fairways of the links. One of the most popular regions in Ireland for both leisure and golf tourists, Munster, or in Irish Cúige Mumhan, encompasses the Southwest and has a number of attractions that feature among the must see and dos in the country - from the awe-inspiring Cliffs of Moher to the hustle and bustle of Killarney. Boasting both outstanding natural beauty and legendary Irish hospitality, it is, however, golf that has put the region on the global map. Nominated as one of the world's top three golf destinations by the Golf Channel, this unique location is home to some of the best golf courses on the planet such as Lahinch, Ballybunion, Tralee, Waterville and the spectacular Old Head at the tip of a tiny peninsula. Located on the Eastern Seaboard in what is now part of Ireland’s Ancient East in the Province of Leinster, Dublin can sometimes feel more like a jumble of villages than a major capital. Rich in history, art and culture as well as full of sights and museums, this city is a popular stop even for Irish residents. Apart from the ever popular Guinness Storehouse, Temple Bar and Trinity College, the capital and its surrounds offer an intriguing combination of links and parkland courses such as Portmarnock, County Louth, The Island, Royal Dublin, The K Club and Carton House. Golf apart, there are a number of diverse attractions within an easy driving distance of Dublin including famous archeological and historic sites. Famous for not so good reasons in the past, Northern Ireland (part of the Province of Ulster) is now thankfully a very peaceful part of Ireland that has rebounded both economically and culturally and is one of the world's must-see destinations. From stunning coastal landscapes and cozy rural villages to underground caverns and even a crisp factory, there is something for everyone in this small country that has recently also gained fame as the filming location for Game of Thrones. Legendary natural attractions, such as the mystical Giant's Causeway, join newer arrivals, such as Belfast Titanic, as the top attraction, apart from great shopping, world-class restaurants, remarkable history and culture, lively music scene and outstanding golf. Producing number of Major winners such as Rory McIlroy, Darren Clark and Graeme McDowell, the country is home to Royal County Down – consistently ranked by Golf Digest as the world’s best golf course and Royal Portrush – the only course in Ireland to have hosted the Open Championship. Come for golf and stay for the ever pervading magic! Ireland’s North West (part of Provinces of Ulster and Conracht) has been a little off the usual tourist trail, but this is starting to change with the growing popularity of the Wild Atlantic Way driving route. Rimmed by the Atlantic, the area presents a great variety of scenery, from dramatic coastlines and beaches to fish-filled rivers and lakes, and endless mountains and boglands. It is a treasure trove of interesting, unique and beautiful places filled with ancient forts and historical sites, dramatic headlands and breathtaking landscapes, peaceful rural villages and vibrant towns and villages. 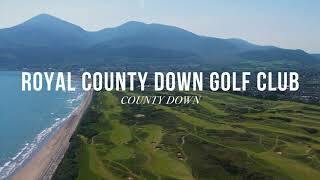 This is also the hidden gem of golf in Ireland with some great links courses in counties of Sligo, Donegal and Mayo.